Old gold color. Herbal aromas and flavors of dill aioli, caramelized prune, chamomile, ginger, bitter orange, dried leaves, and cardamom with a lightly tannic, bright, bittersweet light-to-medium body and a smooth, medium-length finish with accents of tea, gentian, and burnt sugar finish. An assertive vermouth that leaves the door wide open for cocktail play; bitter, herbal, and richly caramelly. Bottom Line: An assertive vermouth that leaves the door wide open for cocktail play; bitter, herbal, and richly caramelly. Vermouth is an aromatized, fortified wine flavored with certain spices and herbs, including tree barks, seeds and flowers. Historically there were two main vermouth styles, a sweet Italian vermouth and a drier, lighter French vermouth. Today many styles of dry and sweet, red and white vermouths are made in many regions of the world. More and more diversity in style is seen with the success of new-world, craft vermouths entering the market. Enjoy these wines on the rocks, with soda, or in your favorite classic cocktails like a Manhattan, Martini, or Negroni. 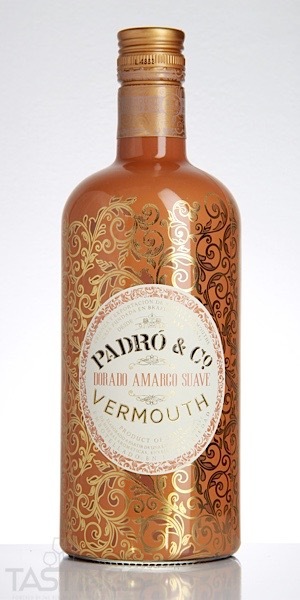 Padro & Co. Dorado Amargo Suave Sweet Vermouth rating was calculated by tastings.com to be 84 points out of 100 on 10/19/2018. Please note that MSRP may have changed since the date of our review.